Amazing the things you can find when you root around under your bed. I found this photo a few months ago whilst searching around for a particular photo to print up for an exhibition. I think I took this about seven years ago and originally didn’t really like it too much. Sometimes it helps to leave things alone and then go back to them after a while. It’s one of the reasons I tend to print up every photo that at least reaches the “Ok” box for me. I tend to have boxes of printed digital photographs as I like things the old fashioned way, there is something about rooting through boxes of prints rather than trying to find something on a computer. Its much easier to come across photos that didn’t make it the first time but then on second glance just seem to work. I took this photo near the cricket pitches in the Phoenix Park. I was working on a series of photographs of the old tudor style house that used to be the changing rooms for the GAA pitches and happened to move about ten feet to the right of the house. It’s a digital image using an infra red filter attached to the lens on the camera. 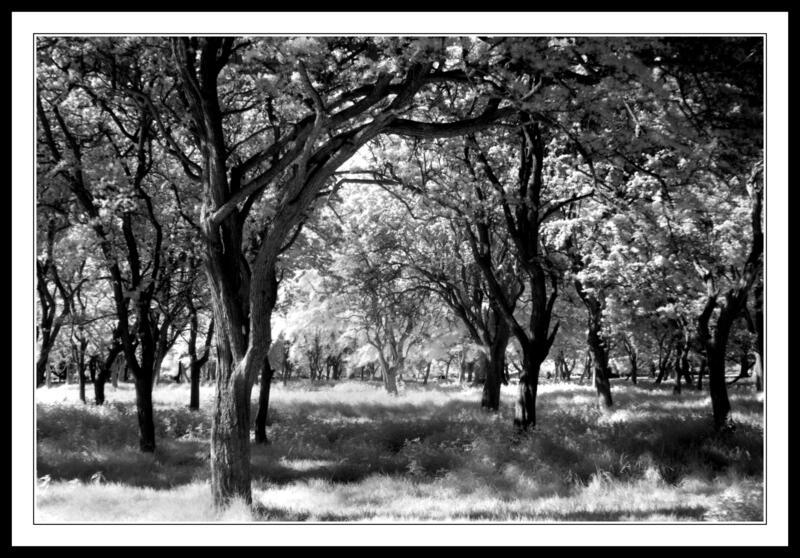 This entry was posted in Black and White Photography, Infra-red Photography, Phoenix Park, Photography and tagged Black and White Photography, Dream Like, Infra-red Photography, Phoenix Park, Photo, Photography, Trees. Bookmark the permalink.